Each season, the NBA playoffs start on a Saturday. But if you want to mark the true start of the postseason, you'll know it's that time of year soon as LeBron James sends his annual "Zero Dark Thirty-23" tweet, signaling that he's going off the grid to take care of postseason business. Like this one. Two-time reigning MVP award winner Steph Curry is following suit with James and taking a break from social media for the playoffs, he told ESPN, in order to avoid unnecessary distractions. 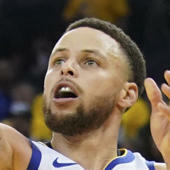 "When you're really trying to zone in and keep your focus, you don't want to have any unnecessary distractions during this point of the season," Curry said. "We have goals to accomplish, and you want to make sure you're giving your all." It might seem like Curry tore a page out of LeBron's playbook, given the fact that they're both so highly viewed in the NBA community. But he's not exactly doing something groundbreaking. Social media can, and often is, a distraction. It's distracting for teenagers. It's distracting for me as a 25-year-old. So why wouldn't it be distracting to Curry? He doesn't get an MVP exemption from distractions. He's focusing in on trying to chase a ring -- anything else falls outside his purview. Curry says he has a way to send out messages to his accounts without logging into them, and might send a tweet or message every now and then. So his social media break isn't a total ban, unlike LeBron. He just won't be refreshing his timeline to get the latest Twitter scoops. "I didn't do it because he did it," Curry said about James similarly shutting down social media each year. "I'm not reinventing the wheel. It's just a way to help me keep my focus on what's important."